What makes us the top fence staining company in Plano? Simple. We specialize exclusively in fence staining! While some competing fence companies in DFW treat fence staining as an after-thought, we do things a little differently and it shows. Fence staining is our #1 priority and focus. This philosophy makes us the only complete fence staining company in Plano TX. 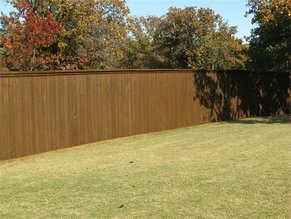 Unpredictable weather in DFW is often the cause of unsightly discoloration and deterioration of your fence. Years of snow, sleet, rain and hail can wear away your fence's natural shine. That's where we come in. Staining is a popular and affordable alternative to repair or new fences. Areas and suburbs in DFW served include Plano, Frisco, Garland, Richardson, Allen TX, McKinney, Carrollton, Lewisville, Desoto, Irving, Mesquite, Rowlett, Flower Mound and more. Fences made with balustrade infill are among the most formal of all fence types. They are usually accented by decoratively molded top and bottom rails and ornate baseboards. Balusters with round ends can be inserted in holes that are drilled into the stringers. Square-topped balusters and sawn balusters are often inserted into channels to hold them in place. The baluster bottoms are then angled or notched to fit the bottom stringer.